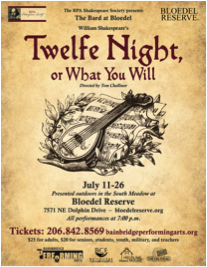 In this podcast, BCB’s Channie Peters interviews Tom Challinor, Director of the Shakespeare Society of Bainbridge Performing Arts (BPA) about this year’s production, Twelfth Night. 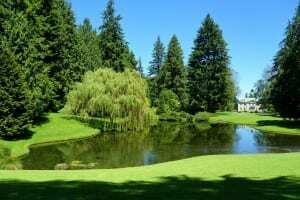 It will be performed at the South Meadow of Bloedel Reserve on three weekends from July 11th until July 26th. Tom is a seasoned and long-time student, actor, teacher and director of Shakespeare. 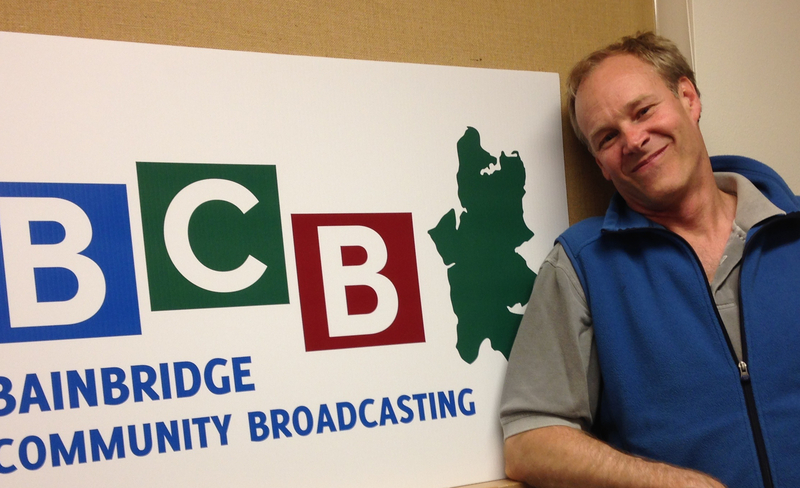 In this interview, he gives us a brief director’s insight into “Why Shakespeare?” on Bainbridge Island. And he explains how this production fits perfectly into the pastoral setting of Bloedel Reserve. All Twelfth Night performances start at 7 pm. Gates open @ 6 pm. Patrons may enter the Bloedel grounds earlier by paying a reduced same-day-only rate of $5.00 valid after 3 pm. Patrons must be on the Will Call list or present their ticket(s) to Bloedel Reserve to take advantage of this offer. Please note: Picnics will be allowed in the meadow after 6 pm. Beer and wine will be available for purchase. No BYOB Allowed. For more information, visit bainbridgeperformingarts.org. At Bloedel Reserve, the residence (now a Visitors’ Center) stands behind the pond. Ticket purchase in advance is encouraged because last year’s Shakespeare production (The Tempest) sold out. Tickets may be purchased online at bainbridgeperformingarts.org or at the box office at 200 Madison Ave North. Tom also teaches popular weekly drop-in classes on Shakespeare. In June and July, classes will be on Mondays at Waterfront Park Community Center (formerly, the Senior Center) from 2:30 to 4 pm, and on Wednesdays at BPA from 10:30 am to noon. Starting on June 2nd, the class will be reading Twelfth Night. 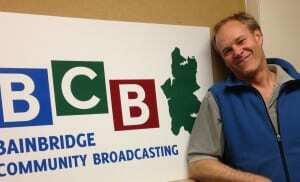 Credits: BCB Host: Channie Peters; BCB Audio Editor: Stuart Stranahan. Synthetic music splash: Dave Bristow. BCB ferry music: Dogfish Bay Studios.